Kuala Lumpur, 23 May 2017 – As part of Vietjet’s exciting “Free summer, Fly for free” campaign, the airline is launching another a three golden-day promotion which offers millions of promotional tickets priced from only USD0.00 within the golden hours of 1.00pm – 3.00pm (Malaysian time) starting today until 25 May 2017 at www.vietjetair.com. The promotion is applicable on all of Vietjet’s domestic routes within the travel period of 1 August – 31December 2017 (excluding public holidays). 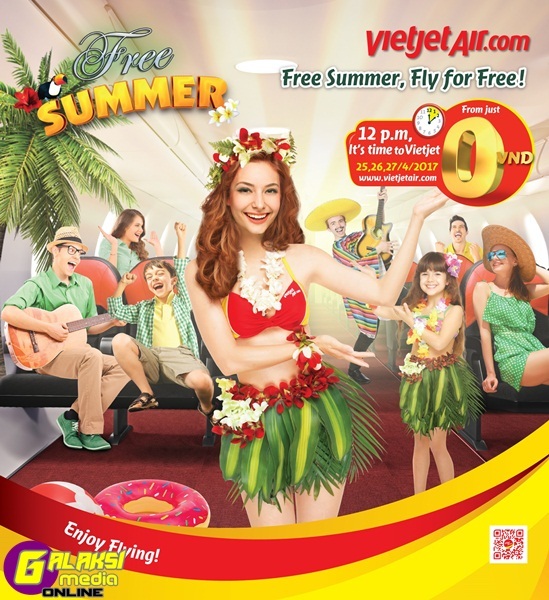 From now until 4 June 2017, lucky customers could also walk away with weekly rewards of five free return flights – each with five free tickets for a five-person group and a grand reward of a free packaged tour to an optional destination simply by participating in the “Free summer – Fly for Free” game at Vietjet’s microsite: freesummer.vietjetair.com. To add on further excitement, a series of activations will also be launched under the summer campaign including interactive games, performances by Vietnamese and international celebrities and a “Vietjet Bikini” challenge at selected domestic and international airports and onboard Vietjet flights, which are expected to “heat up” your summer. The promotional tickets are available for booking within the golden hours of 1.00pm to 3.00pm at www.vietjetair.com (also compatible with smartphones at https://m.vietjetair.com) or at www.facebook.com/vietjetvietnam (just click the “Booking” tab). This is indeed a golden opportunity as a stream of cultural, gastronomic, art festivals and tourism related events are slated to take place across Vietnam in the next few months. Not to be missed events include the Southern Land Cuisine Festival, Sa Pa Summer Festival, Da Nang International Firework Festival, Nha Trang’s ever popular Sea Festival and Hoi An Lantern Festival to name a few. Those interested to savour the taste of new experiences and bask in the bustling ambiance of the various cultural festivals should jump on and make your booking now. You never know, you just might walk away with five extra tickets for your next holiday with your friends and loved ones!